and the progeny of creatures from beyond the farthest planet? This article was originally published as Normal Bean News #50 in ERB-APA #76, Winter 2003.
of the actual dialogue and narration to give you a feel for the book. ... in silence the little group stood contemplating the weird, unearthly vista upon which no mortal had ever gazed before. And it well might have been the grotesque landscape of another planet. A black, somber planet. Flashback: In 1765, Captain Roger Stuart of Plymouth, England, was commissioned to transport to America a large shipment of gold coins and a quantity of gems and jewels (with an estimated 1947 value of about three million dollars). His wife, Barbara, accompanied him on the voyage as they were planning to relocate to the colonies. Their young daughter was left temporarily with her grandmother in Plymouth. The daughter presented her mother with a little ivory miniature inscribed: "To my mother, Barbara Stuart, from her loving Jane." (p.23) She also made her father promise to write to her in mid-ocean, seal the letter in a bottle, and then throw the bottle overboard. This letter included the coordinates of the ships at the time, and also mentioned sighting a spiral that was presumably the cause of the vessels' wreckage. This letter will find its way to the daughter, Jane, when she's a grandmother, and would many years later be discovered by Ellen, prompting her fiancé to design and build the Ellen Stuart and attempt the salvage operation. First Footnote: An explanation as to how this innovative diesel-engine submarine is actually an atomic sub! While on a research project to synthesize petroleum, Phillip Montague discovered that diesel oil when subjected to electron bombardment would break down into its basic constituents, liberating vast amounts of heat and oxygen in the process. He also writes that the enormous steam pressure generated is regulated and directed between the inner and outer hulls, to counteract the enormous pressure found at great ocean depths. But no mention is made as to why the enormous steam pressure doesn't make the inner hull implode. It's also the only footnote signed (with the initials "J.R.B." – possibly a typo for "J.C.B." but more likely the initials of JCB's wife and long-time assistant in his art and writing projects, Jane Ralston Burroughs). As the twisting submarine was pulled ever deeper into the black maelstrom, Von Benson found himself confronted by both the probability of death and the actuality of a beautiful woman in his arms. The man's reaction was a logical one for him: he chose to take the girl even as Death was taking them all! Von closes the hatch and sweeps the unconscious Ellen into his arms. As Von carries her to her cabin, he explains to the doctor in passing that she's only fainted. The geyser of water shot Mr. Flobs and the little spaniel dog out of the galley in time, but the mute stowaway Bucky was caught inside and presumably drowned. Dirk, Von, and Wicks go outside to check things out, and Ellen offers to take command in their absence, but our hero declines her offer. "Dirk surveyed her a moment. 'You're a woman and you faint too easily,' he said. 'Ellis is in charge – get back to your man.' " Ellen, who had actually been given fourth in command status, after Dirk, Von, and Phil, quite naturally resents this, but since Phil broke his arm in all the gyrations and the breach of the sub and is therefore under opiates at the moment, she now spends a lot of time nursing him. Second Footnote: (p.39) A pretty nifty description of the aluminum alloy, segmented, deep-sea diving suit they use, with a double-door in the helmet to pass in food, two-way radio sets built in to the helmets, and mechanisms for air-recycling and waste disposal. It's equipped with a short-handled ax worn at the side. Outside the sub, Dirk and Von have gotten a bit ahead of Wicks. They come back to find him dead after fending off some unknown monster with his ax, the blade of which is still smeared with blood. (p.43) It will turn out that he died of a heart attack, as he had a weak heart, and they are left to wonder what manner of creature attacked him. After they bring Wicks back aboard and the doctor does his autopsy, Dirk goes back outside to bury the body in the sand, instead of doing the usual "burial at sea." (p.46) They are now at 3,000 fathoms (18,000 feet), but the pressure gauge registers only the pressure found at thirty fathoms. (p.51) It will remain this way for the rest of the novel, which is convenient as it lets folks move about a lot more easily! 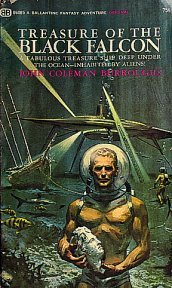 The chapter title gives it away: the mute stowaway Bucky's head is seen floating outside the submarine, alive and looking in at the portholes. A fin is now where his neck was. They wonder if it isn't some strange fish that just happens to look like Bucky. They are now at 3,500 fathoms and the tunnel through which the vortex has been pulling them levels out, ten hours after they were first caught in it. They find the three sunken vessels they were seeking. They guess that the ships sank straight downward, just so happening to end up at the same spot that their vortex tunnel landed them (which conveniently takes care of any questions the reader might have had as to why the ships are still intact, when the wooden brigs could not have withstood the vortex that has nearly wrecked the sub). This next bit is told from Dirk's point-of-view (as is most of the rest of the novel), with Dirk waking up at the sub's engines being started, thinking that Von is commandeering the sub. Dirk rushes through the sub to find that Phillip – delirious and thinking they're all Nazis – is wielding a .32 automatic and using the last remaining fuel to gun the sub across a trench so they can get to the three ships. Dirk and Von face Phil off, with Dirk dropping to the floor – a bullet whizzing over his head – and Dirk then knocking Phil cold. Undeveloped Jogulars now make their first appearance. They look like giant brains with a single eye right in their centers, and are able to exert a semi-paralyzing hypnotic influence telepathically. One of them draws Ellen back into the cabin where she found the shell of Barbara Stuart. Ellen faints. Chapter 6: "Like a Huge Brain!" Dirk now gets to tell Ellen, "I told you that you faint too easily," (p.82) after he and Von bring Ellen back to the sub. They find out the reason why Phil has been so badly off when he just suffered a broken arm: he had also ruptured a kidney, that had now become badly infected. The doctor had to perform immediate surgery; however, because their morphine supplies are depleted due to the storage area having been flooded when the sub's hull was breached, Phil may not survive. Von viciously slaps Dr. Kingsley around, as a form of discipline, and to make him do better for Phil, until Dirk reminds Von that the Doc can't do better for anybody if Von kills him. Now the big revelation! It turns out that the reason the doctor has been rather twitchy of late is that he is a long-time morphine addict. A true physician, however, the doctor has already volunteered the entirety of his personal supply of morphine for use by Phil. After some clever business where they find nothing but lumpy gunpowder in the treasure chests, but then find the gold and jewels after all, hidden under more gunpowder in the gunpowder kegs, Von and the crew celebrate by getting sloshed on rum. Dirk, who refrains, thinks: "The submarine was a powder keg, anyway, with men, gold, danger and a girl – that rum could just be the spark to set it all off." (p.90) While the rest of the crew are three sheets to the wind, Dirk looks out a porthole and sees mysterious lights on the wrecks of the ships. These turn out to be from a raiding party of Jogulars, who carry away the bulk of the gold to their city – that is just across the valley and over a pass between two buttes – but a fair hike away from where their sub is now parked. This is where Willoughby reports that he has made radio contact with the S.S. Courageous and that two rescue vessels are now on their way from England! Their dilemma: they can be rescued, but what about all their gold that some mysterious creatures have carried off? To keep things moving, I'll skip ahead and interject here that Willoughby is a raving loony – because of his well-known whimpering fear, and because of the same mysterious parasitic infection that made Phil go bonkers. (It is even likely that these are the same parasitic microorganisms that have turned Bucky's head into a seagoing creature, but this is never explicitly stated.) Willoughby later reveals his delusional state to Dirk in Chapter 9 (p.107), right before he goes into a screaming mania and dies. Phil dies suddenly – but did he die of a non-fatal dose of saline solution that somehow got into his penicillin? No, the autopsy shows that his "skull cavity ... at the time [the doctor] examined the contents, did not contain a human brain." (p.100) The doctor tells Dirk that he has seen a similar structure – of strangely interlocking cells with astounding capacities for expansion and contraction – in the puffer fish found off Madagascar. This is where Willoughby's lunacy is revealed and he dies. This is also where the girl starts putting things together that Dirk realizes even he hadn't connected yet. (p.110) Von Benson and Hill choose to follow the tracks left by the Jogulars that snatched the gold, and they finally return to the sub after being gone for four days. Hill dies after mumbling about a city of strange people, but Benson falls asleep and seems normal when he awakes. Shortly thereafter, Dirk finds the officer on watch has been clobbered, two .45 automatics have been taken, three diving suits are missing, and all the remaining oxygen tanks sabotaged, except for the two that were inaccessible while being recharged. Benson, Harry Grube, and Ellen are missing, and Dirk and the doctor go after them. The love-story for the hero and the girl essentially starts here, with Dirk showing his growing feelings for Ellen by agonizing over the question as to whether she went willingly or not. In this underwater jungle, Dirk leaves the doctor in his wake, and then Dirk is attacked by a huge wasp creature with fangs and a stinger. Dirk struggles to fight the enormous thing – in the first man vs. creature battle in the novel (and we're already on p.123!). After a bit of a struggle, he manages to cut it in half at its wasp waist. "...that it was already part me – that I was part of it – and sometime, very soon, we would be merged into ONE." "Maybe it was a lady brain proposing to you," Dirk suggests. Now as the doctor remarks, it'd be "easy to believe we've been transported to another planet." (p.128) Accordingly, we get the speculation regarding the crater they've found being evidence of a "meteor that had struck the earth in the long-gone past before the ocean had buried the land." (p.129) Conveniently – so our heroes don't have to keep trudging around in their diving suits – the earth emits air through fissures at this point, at a slightly greater pressure than the water it displaces, forming a vast, habitable, air bubble that our people can penetrate. (p.130) Once inside, they doff and cache their suits and tanks, and start out to explore the rivers, forests, and dimly seen creatures that lurk there. The shot that was heard the night before turns out to be Von's discarding of Harry Grube as his accomplice. Dirk finds Grube's body shot through the back of the head with a .45, and since microorganisms immediately start consuming anything dead here, Grube's bald head and gold teeth confirm his identity. (p.140) Dirk then follows the river downward into the center of a half-mile wide circular cavity into which all the rivers cascade – into an abyss. At the far embankment of this is a city, with architecture that is a mixture of old London, Roman, and late 17th century sailing vessels. (p.141) The inhabitants of this city, including most of their clothes, are all of whitish, jelly-like flesh with a single, real eye in the middle of their foreheads, and sightless eyes where the originals were. (p.142) These are the Jogular replicas of ancient Roman sailors, 17th and 18th century English seamen, and a few more recent acquisitions of various sorts. They are all telepathic and voiceless, even the dogs that have silent barks, and the barmaids that sing silent songs. (p.146) Their bodies are softish, but still have enough fibrous tissue to stand and move about, even for Jogular men to ride Jogular horses. Dirk awakes to find himself in the dungeon with Dr. Kingsley and the Jogular of Roger Stuart, whom we get to know a bit. It turns out that the presence of the submarine by the wrecked vessels had revealed to the Jogulars in the city the presence of the gold, thus exciting their gold-fever, acquired from the hosts they replicated. Fecus, a Roman with a badly messed up face (resulting from his replicating a corpse with a crushed head), used the gold to bribe his way to power. He usurped the throne from Roger (the rightful king by popular acclaim, succeeding a good Roman ruler about a hundred years ago), then had Roger thrown in the dungeon, as a prelude to having him thrown into the Great Falls (which is the abyss into which the rivers cascade). Also, he is now using undeveloped Jogulars to try to brainwash Barbara Stuart into loving him instead of her husband. The traitorous Von Benson, it turns out, had been infected with the parasite, and he is now already part Jogular. He has made a pact with Fecus – for a share in the gold, the girl, and help getting the sub back to the surface. Ellen is therefore being subjected to the undeveloped Jogulars along with Barbara, to try to convince Ellen she loves Von. Also, rather cleverly, Von has something that these creatures want – the large stock of morphine now in the flooded storage compartment of the sub! Chapter 15: "I Love You!" Queen Barbara Stuart, Ellen's five-times great grandmother, after making this spectacular entrance, tells us she had also been planning her self-destruction. She had been planning to jump into the Falls, after Fecus had had Roger thrown into them, rather than live without her husband. (p.199) Conveniently, Fecus had insisted that Von wear a "little known Roman helmet" that has a face mask, as part of the imminent double-wedding ceremony (of Von to Ellen and Fecus to Barbara), so Dirk now uses it to disguise himself as the would-be bridegroom. At the wedding, Roger, who had been recaptured, is drugged into giving Barbara to Fecus in marriage, after which Fecus will be free to kill Roger. Dirk struggles successfully to keep his thoughts from giving him away to the telepathic Fecus and his nearby undeveloped Jogular brains, but the jig is up when Jogular-Von suddenly puts in a reappearance. Heroic battle ensues, with our heroes attempting escape through the room in back of the throne where the brains are kept. Dirk believes they have made their escape out of the palace, gotten horses, ridden across a plain, but ... he now finds himself alone on the plain. Not sure what to believe is real, he begins searching for the tracks of their horses, and is still searching when Fecus' warriors overtake him. He will find out that the brains had induced an hallucination that Roger, Barbara, and Ellen were with him, when he had actually slammed and locked the door on them, leaving them in the room with the brains to be recaptured. Here we get the first mention by the doctor of "a mysterious Jogular who wears a mask at all times and maintains a laboratory in the palace. He is supposed to possess extraordinary scientific knowledge." (p.219) This mysterious Jogular is said to be helping Von with plans to get the sub to the surface, as Jogular-Von intends to take Ellen with him back to England! How he hopes to pass as normal when he has an eye in the middle of his forehead is not mentioned. Other characters make their appearance: Jim Peacock, innkeeper, who is friendly to Roger Stuart; Ezekiel, a dwarf stone-cutter who specializes in carving angels, who is loyal to the Queen; Volgus, a guard whose arm Dirk had twisted, who is in service to Fecus. Much as his father would, JCB now has Fecus abuse an old religious superstition to justify his having his enemies thrown into the Falls – by claiming them as ritual sacrifices. This is further explained, but essentially they are a sort of fertility offering. Jogulars reproduce by periodically casting off cells, and the Jogulars in the city cast their cells into the Falls, from which these cells eventually find their way out to the ocean in search of hosts. The sacrifice victims will therefore either become hosts themselves to cells already in the abyss, or add their own cells to this font of future Jogulars. (p.221) Roger, Dirk, and Dr. Kingsley are the last in the line-up of sacrificial victims walking the plank, overseen by the vengeful Volgus. The Jogulars that precede them leap unassisted, after expressing their loyalty to King Stuart. The doctor is next, but he slips and falls, and Volgus kicks him viciously in the face. It is then that Dirk slips the bonds on his wrists, and much sword-fighting mayhem ensues. They escape to lead a Stuart-ite uprising against Fecus and his minions, but the tide goes against them. Phillip then tells of himself, and of how he had been helping Von with his plans to marry Ellen and return her to the surface, but that was before he realized Von was now a Jogular, and that Ellen was not in love with Von. Phillip had been granted materials and metalworkers by Fecus, because Fecus wanted Phillip to make firearms for him. After he found out the truth, Phil instead used these resources to make new air cylinders, secure the help of the remaining men on the sub, and then use the rifles they had made to retake the city. Phillip also says that the brain Jogulars believe there may be other Jogular colonies somewhere in the ocean depths, due to emanations they are aware of during their meditations – therefore, room for sequels? Phil has read Dirk's thoughts, and quite decently says that Ellen is Dirk's now. Dirk demurs, and says that Ellen must choose for herself, even if her former fiancé is now a mask-wearing Jogular. There's time left for Von to kidnap Ellen, leaving a (trance-induced) note saying that she has been infected with the parasite and is now sprouting scales as an incipient Jogular, so that she is going away with Von, as they are now two of a kind. This allows Dirk to agonize a teeny bit more, including creepy thoughts of gills and an eye in the middle of Ellen's forehead. But he goes after her anyway, to find out if she really loves him or not, as he realizes she may have left only because she didn't think Dirk could be open-minded enough to love her as a Jogular. He is nearly fooled one more time into some more agonizing, when he hears Ellen's repetition of her trance-proclamation that she loves Von, but then he remembers the very same brainwashing-induced words from before. The quick underwater clinch ending, with no definite rescue for the sub or its remaining crew. No follow-up on the former stowaway mute Bucky, the head with fins. The spaniel dog is never seen or heard of again, after it doesn't die in the galley with Bucky. The dwarf stonecutter Ezekiel stays around long enough to start to be interesting, but is then killed offstage. Frenchy's "Zee's ees zo!" accent, which makes the lapsing "Thee's and Thou's" attempt at an 18th century accent for Barbara and Roger look good – and there's even a footnote (p.229) to try to cover how shaky that is! Once things start happening, they really move along, without overdoing the escapes, captures, and rescues. The girl helps save the hero in the end, plus she is only lusted after by one of the villains. (A look-alike, dagger-throwing, 5x-great grandma is brought in for the other villain to covet.) And despite Dirk's remark, Ellen doesn't actually faint all that much. The phrase, "A Fate Worse Than Death," is never mentioned. The clever morphine angle, since the Jogulars are "all brain" – worked in nicely with the doctor's addiction. Most of the footnotes (except for the "atomic sub" one).